Before Harlow was born, I was terrified of putting my two girls in the same room together. Mazzy is not a delicate child. She climbs all over everything and can play a little rough. I didn't know if she would understand that a baby requires a more careful touch. I imagined her tossing toys into Harlow's crib, flipping her whole body inside while Harlow was sleeping or smothering her with a blanket unintentionally. On Friday, Harlow will be three months old, which has always been the day we said we would transition her out of the bassinet in our bedroom into the crib in Mazzy's room. It will be the day that 'Mazzy's room' officially becomes 'Mazzy and Harlow's room'. We've told Mazzy since before Harlow was born that her little sister would eventually be moving in. We've cleared drawers, redid the closet and squeezed a crib into the corner that used to house Mazzy's glider chair and reading lamp. Through all this, Mazzy hasn't blinked. In fact, she has unwavered in her excitement. She even helped me transfer her stuff to a different drawer, weeding out clothing she no longer wanted to make room for Harlow's wardrobe. I'm not sure how Mazzy will react when "the big move" actually happens, but I'm no longer worried about her hurting the baby. 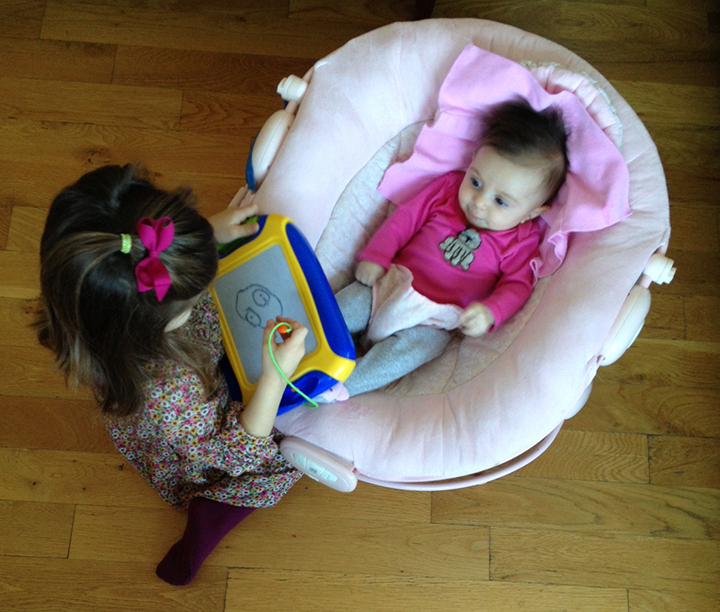 Much to my relief, Mazzy has never been more gentle or loving than when she is around her baby sister. The picture up top is my favorite picture of Mazzy and Harlow so far. Every other picture I have of them together is the top of Mazzy's head blocking Harlow entirely. Why? Because Mazzy loves giving Harlow impromptu forehead kisses and there is just no way to get a good shot. In addition to frequent kisses, Mazzy makes Harlow presents at school, she tells her she loves her repeatedly, and runs to give her a pacifier every time she starts crying. Or she'll scream for me to get the pacifier, which might be slightly insulting, but it's still a show of concern for her sister's well-being. Yesterday, Mazzy drew Harlow's portrait. She sat down directly in front of her, drawing tablet in hand, and very seriously, tried to capture the essence of her sister. Below is Harlow complete with big eyes, crazy hair and spit-up coming out of her mouth. I think Mazzy pretty much nailed it. Also, there is no better sound than Mazzy saying her little sister's name out loud. "HarrrrrLOOOOH". She enunciates the last syllable like she's a valley girl. I love it. Remember on Monday when I told the story about trying to get Mazzy to leave the house without her Boo? Do you know how we finally got her to do it? We told her Harlow would watch it for her. Harlow was sitting in her boppy and Mazzy laid that purple rag over her with so much care it practically made me cry. I know their relationship has barely begun, but in that moment, when Mazzy bravely gave Harlow her blankie before she walked out the door, it was her greatest symbol of love and sisterhood. Happy Valentine's Day, my sweet girls. May you have eachother always. This. This is why I had two children. Giving them the gift of one another. Really, you made me tear up? Jerk. This totally made me cry. There is seriously nothing better than watching your babies love each other unconditionally. One of the best parts about having twins – seeing that they do love each other (between the spats). Love the pictures! This is soooo sweet, love that Mazzy gives her random kisses, draws pictures of her, and even gave Harlow her boo. Made me cry with sweetness! I really hope my 3YO daughter and the new baby get along like this. P is very rough and tumble, beating up the boys in her daycare, but she does take care to be gentle around her baby cousin. So I have hope. Thanks for making me cry, jerk. Also, I disagree, the best picture you have of them is that one of Mazzy drawing Harlow. The look of love in Harlow’s eyes is priceless. Aw! Crazy how toddlers can be a beast one minute and completely amaze us the next. Great post! Very sweet. Happy V Day! I love this!! I hope you have a great Valentine’s Day! This made me tear up! I have a 3 y/o little girl and am 30 weeks pregnant with her little brother. I see how gentle she can be with babies because she knows a few. I hope the same is true with her little brother. She can tend to get jealous when I am paying attention to another child, so I am curious to see how that will play out when I am paying attention to her littel brother. I hope she understands:) Happy Valentine’s Day to everyone! AWWWW!! This post was so sweet! I can’t get over the cuteness. 🙂 Happy Valentine’s Day! Awww! *dust in my eyes* This make me really super excited about baby #2. Our son will only be 21 months when he or she is born, but we really really really hope that they have a loving bond like this. So cute! Of course, my 5-year old son can be seen squeezing his 8 year old sister, too…but it’s usually because he’s trying to put her in a headlock. The dog, however, is another story. He gets full, open-mouthed kisses. So are you going to make Harlow a Boo for her transition into the crib like you did for Mazzy? Now I’m crying at work! I hope my daughter is as loving to her brother-to-be when he arrives (just a few days shy of her third birthday). I have 2 girls that are 22months apart. I was nervous at first how my oldest would react. She has loved that baby since day one. Right now at 3 & 15 months they are two peas in a pod. That was the sweetest post ever! I hope the transition goes smoothly Mama! Lucky girls. I always wanted a sister. I’m preparing myself for the day my girl tells me I’m a horrible mother beacuse we decided to only have one kid. The photo of Mazzy drawing Harlow is the sweetest. Such a sweet Valentines day story. This is why we want to adopt another baby so they can have that sibling love and bond. Just hope it happens soon so they will still be fairly close in age. This is sooooo sweet! Darn you for making me well up today! As a parent, you always hope before the #2 is born that the oldest child will be capable of embracing a new young sibling but it just blows me away how they exceed expectations when the time comes. That is our experience with our 3 year old daughter and 6 month old son. You captured it so beautifully with your girls. That’s awesome. Happy Valentine’s Day! Yes, same here. I couldn’t deprive my daughter of this. Magical. Thank you, Ilana. now wishing my son could have a sibling… sniff, sniff. and why is it that mazzy always has better hair days than me?!? When pregnant with our second daughter (born in December) I was constantly asked if I was ‘disappointed to be having another girl.’ The answer, unequivocally, was always ‘no.’ I have one younger sister, and when we found out girl #2 was on the way I was so excited. Your story exemplifies why. Sisters are a beautiful thing. Mazzy is the next picasso! I love her interpretation of Harlow’s hair. dang it, i’m crying in the office. Pregnant with my first and totally bawling over the last picture. Yep, as much as I hate being pregnant, I think I’m going to do it one more time! Was just reading this post again, and I decided it’s one of my favorites of yours. I have an older sister and I know how awesome that relationship is. Lots of turmoil at times, but always full of love! WISH I WAS AN ONLY CHILD. This post is my favorite. Took me awhile to find it, but I just wanted to read it again 🙂 Such love! Love it! Ever since Frozen my two year daughter has been asking for a sister. The bond between two sisters is pretty amazing ( I have three). Just a little nervous if it’s a boy when the time comes.